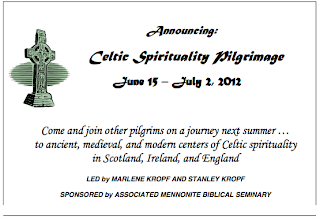 This is how the Celtic Spirituality Pilgrims from North America, coordinated by Marlene and Stan Kropf from the Associated Mennonite Biblical Seminary in Elkhart, Indiana, described their venture in the publicity leading up to their journey across Scotland, Ireland and England. "During the Middle Ages, the practice of going on a pilgrimage satisfied a deep need for adventure, companionship, and spiritual renewal. Today the reasons for traveling to holy places remain much the same. Embarking on a journey with fellow-seekers after God an opening one’s self to new learning and adventures along the way can become a rich context for reflection, relationships and renewal. 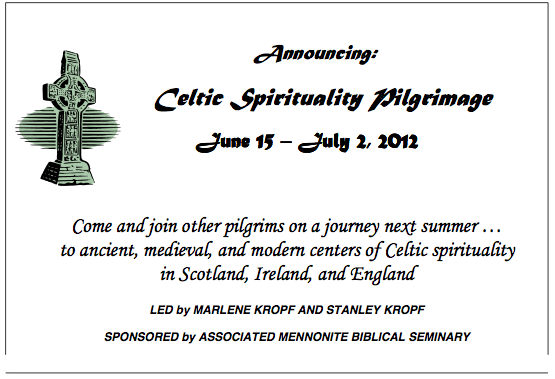 "The 2012 Celtic Spirituality Pilgrimage will begin with several days of retreat on the Island of Iona in western Scotland and continue from there to historic Celtic sites in Northern Ireland and Ireland. In Dublin we will see the magnificent Book of Kells at Trinity College. At Kildare and at Glendalough we will be guided on walking pilgrimages to places associated with St Brigid and St Kevin. From Ireland the group will travel to Lindisfarne, northern England’s holy island, and to the historic city of Durham. The pilgrimage concludes in Edinburgh, Scotland. "Although activities will vary from day to day, you can expect the pilgrimage to include daily experiences of morning and/or evening prayer; stimulating presentations on the Celtic Church and its spiritual traditions; quiet space for retreat; time for recreation and long walks; visits to ancient crosses; and many opportunities for conversation and reflection with other pilgrims." The embryonic Exploring Anabaptism Scotland network is delighted to be helping with the hosting in Edinburgh, as the group arrive at the end of their journey and reflect on how to take what they have seen and heard back to North America.